When I plan to talk something about Chinese snacks, I realize that in Chinese we have different words for the English term “snack”. One type of snack is called Xiaochi (小吃), these are the small bites between meals, but are well cooked food coming with a small portion. In China, each region has their own famous Xiaochi and most of them have developed their own restaurants specialized in their brand, such as Beijing Huoguosi street snack bar and Fiery Palace at Hunan Changsha. 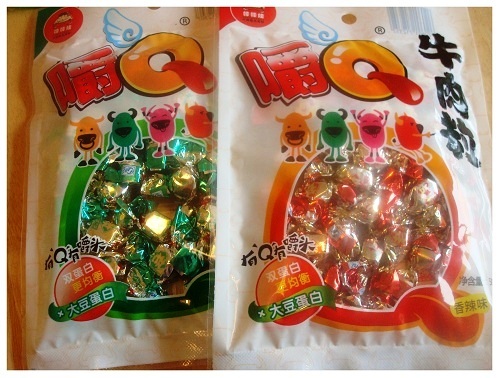 There is another type of Chinese snacks called Lingshi (零食), which is something more than just biscuits and crisps. Here I show some of my favourite Lingshi made from meat. 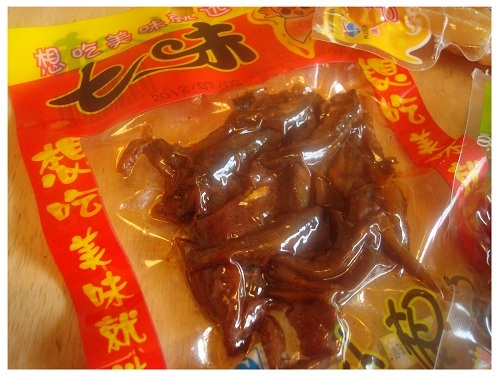 Some of this kind of meat snacks can be dry such as the dry beef is a famous snack in China, called Niu Rou Gan (牛肉干) . The beef meat is seasoned with rich flavours, such as five spiced or hot chilli. They may come with various shapes such as thread or cube. Here are my dry beef cubes, wrapped within the colourful papers, look like sweets. Although the size of beef cubes is small, it is very tasty and chewy, which gives you enough time to enjoy the flavour. The meat snacks also depend upon the local supplies. Such as in Hunan, the place I came from, there are lots of packed spicy fishes, salty and hot spicy. The Hunan locals also make duck meat snacks, including duck tongue, wings and duck necks even. We prefer these part of meat than meat from chest, because they are more tasty, such as duck wings and duck necks are very popular. 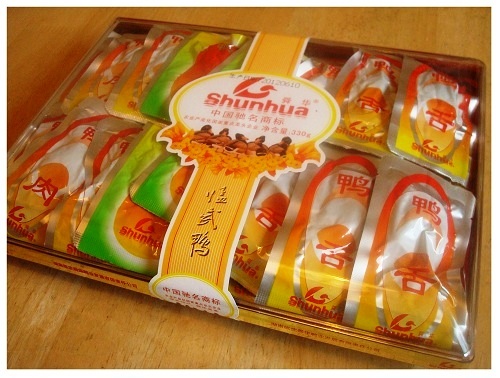 Here is the duck meat snacks packed in a gift box, which makes a perfect gift during festival time when visit family or relatives. 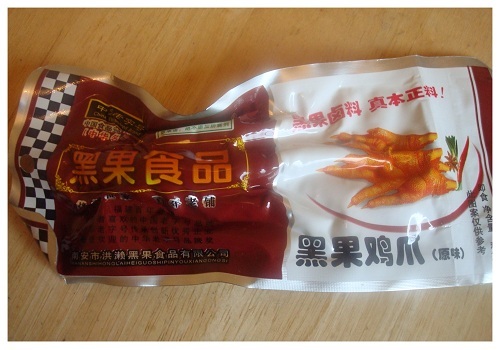 Of course, I won't forget our famous and very normal type of snack, chicken feet :). You don't need to be an adventure eater to try this, because it is just a normal meat with special texture. 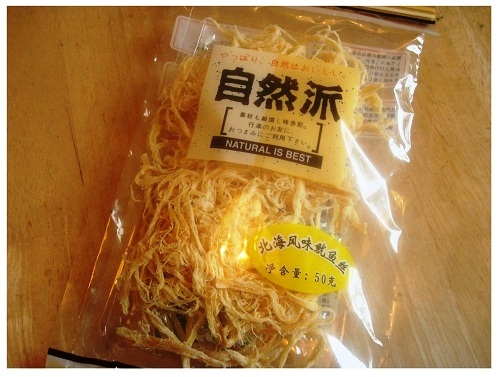 In other regions near the sea, such as Zhejiang, they make the snacks using squid and fish flakes, such as this squid threads trying to adopt some Japanese flavour. 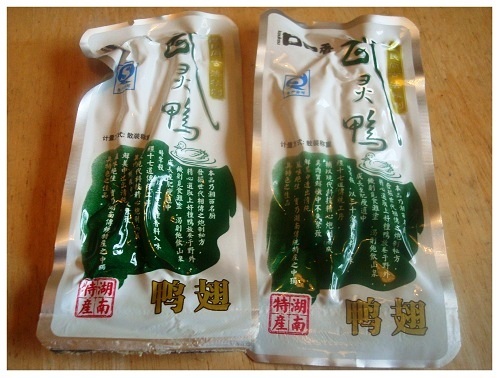 All type of Lingshi come with small portion, packed and convenient to eat. But if you are hungry, they might not be the right choice. For something to fill your stomach, you better go for another type of snacks like Xiaochi, such as meat stuffed buns. But that’s why I like this type of Chinese snacks (Linshi), I can fully enjoy the taste and have no worry about their calories, much healthier than chocolate bars, right? 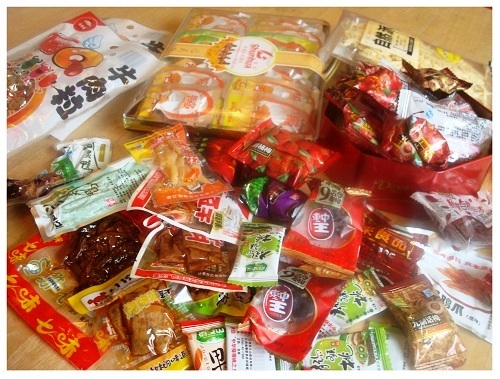 In next post I will show you some of my Chinese snacks made from fruits, seeds and tofu.